Are you looking for a new cleaner to make your pool sparkling during those sweltering summer months? Then look no further as below we have provided a step-by-step guide to help you choose the best robotic pool cleaner for you. These automatic pool cleaners can help you to keep your pool hygienic and clear, so you don’t have worry about carrying out the work for yourself and it is one less thing for you to worry about. Simple and quick to use they bring little effort to cleaning out your pool, so you, your guests and family can have fun splashing around in the sun. Robotic pool cleaners are self-contained units, meaning they operate separately from your filtration system. The pool cleaner will pick up debris and dirt, so your filter system doesn’t have to. They have two motors; one pump motor which takes in debris through the filter, and a drive motor which keeps the unit pressed to the bottom of your pool and to propel it around the pool’s surfaces. Some might even recommend using your robotic pool cleaner without your pool filtration system on as stagnant debris can fall to the bottom, so the pool cleaner can pick it up. The filter on the pool cleaner is easy to clean. Some robotic pool cleaners might have an internally charged battery, meaning they don’t need to be attached to a power source. Some, however, may need a cord to connect them to a power source, but don’t worry! Robotic cleaners have a low-voltage and will automatically shut off any power if they detect a problem. With such a wide variety of robotic pool cleaners on the market, the choice can sometimes be overwhelming. Our guide is designed to give you an in-depth overview of 5 of the top robotic pool cleaners currently on the market, their pros and cons, public opinions and reviews from those that have already purchased one and what to look for when buying a robotic pool cleaner with some information on their most unique features and benefits. This robotic pool cleaner is considered the best on the market at this moment in time. It weighs 19lbs and comes with a 2-year warranty. It includes a patented swivel design which means it can move around your pool without the cable getting tangled or damaged. It also climbs up the walls and gets right into the corners of your pool. Within two hours the Dolphin Nautilus CC scans your pool with its advanced technology and then cleans it no matter what the shape of the pool is. It then filters, scrubs, and vacuums the floor of your pool, up the walls, and in the waterlines for pools up to 50ft. This unit cleans by figuring out the dimensions of your pool, so it can maximize its efficiency. Even the most difficult dirt, biofilm, bacteria, and algae can be cleaned with its advanced Active Scrubbing brush, which spins at a fast rate to truly scrub the surfaces of your pool. This brush can scrub both small and large debris and make it simpler for the cleaner to collect it using the two filter system. One filter collects small pieces of dirt while the other picks up large pieces of debris. These filters are easy to remove and clean. Its hyper-grip tracking system allows it to stay gripped to your pool surfaces. The overall rating, according to Amazon is that 70% of 587 customers reviewed this product at five stars, while 12% rated it at four. Most reviews claim that this pool cleaner does the job very well, turning dirty and green pools into sparkling beauties. 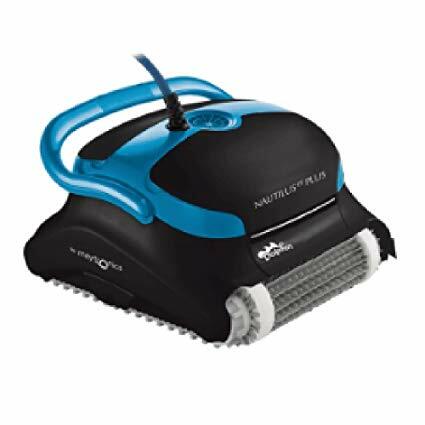 Several reviews state that the Dolphin Nautilus CC is easy to use and clean and allows you to relax rather than cleaning your pool manually. This robotic pool cleaner can calculate the size, shape, and pattern of your pool so it can clean at its highest efficiency. It scrubs and brushes your pool while vacuuming as well, and can reach the steps, and sides for optimal cleaning. It comes with a reinforced cartridge element rather than bags which makes it much easier to clean. This unit also has a three-hour cleaning cycle and automatically shuts off once it is finished. This unit weighs 40lbs and has a 55-inch cable. It can clean your pool well no matter what material, this includes fiberglass, granite, and vinyl. It’s cleaning pattern is innovative and covers the entire pool. There are no additional add-ons such as hoses, pumps, or hookups. It does everything automatically and works separately to your built-in filtration system. The TigerShark QC saves you money on energy and can help you save up to 94% on energy costs. 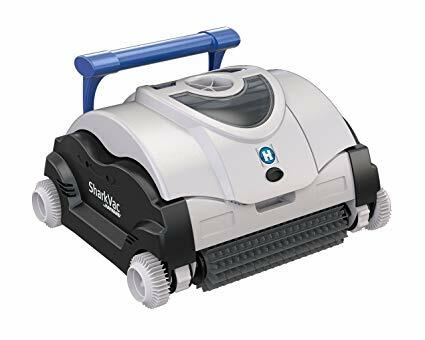 It uses much less energy than other robotic pool cleaners. It uses a 24 DC volt motor which is extremely energy efficient and works in tandem to the 3-hour cleaning cycle, so it performs better and saves you energy. This unit is also quiet as it works and can be used at night if needed. It is easy to use, just plug in and place in the pool. This is due to its unique cartridge filter system which makes the unit easier to operate. It’s also very easy to clear the filters of the debris it has picked up. The overall rating for this product is that 57% of 372 reviews rated this product with five stars, while 14% claimed it performed at the level of 4 stars. Most reviews state that this product has helped to save them time, is easy to use, and has high performance. One thing that seems to be important in these reviews is how easy the filters are to clean. This pool cleaner can clean any pool up to 50ft long and is powered by microprocessor technology in order to pilot it. It can clean the floor and walls of your pool, including the waterlines. Within just an hour, this cleaner will have finished your pool, leaving you with more time on your hands and reducing your overall expenses. 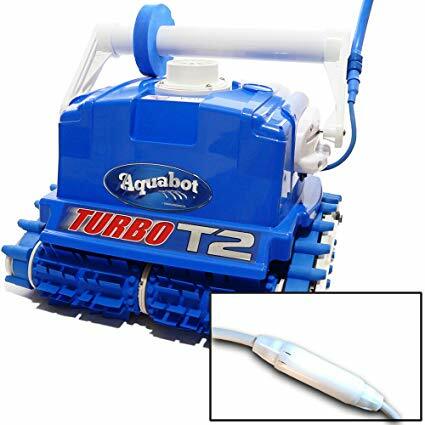 The Aquabot Turbo T2 will help to keep your pool hygienic and safe and looking sparkling clean. Regardless of the shape, size, or material of your pool, this pool cleaner will use its microprocessor to clean the whole area in an hour or less. It is currently the fastest residential Aquabot pool cleaner on the market. The scrub brushes have the power to remove all debris and dirt from the surface of your pool. It can map the entire surface of your pool within an hour and climb at a 90-degree angle. The Turbo 2 also includes a reusable filter bag which is used to gather the debris and dirt from the bottom and the walls of your pool. Due to the Turbo 2 having its own internal pump motor, there is no need to connect it to your pool filtration system as it has no need for an external pump system. While there are limited reviews on Amazon, almost every single one has given this product five stars and complimented its capability. They praise how quick the Turbo T2 works. They all claim the Turbo T2 has saved them valuable time and done a very good job. The only recurring complaints are that the cables can become entwined and Aquabot should provide a second filter bag. This pool cleaner can work in any sized pool and along any contour. It will compute the size and decides the most efficient and effective cleaning plan. Along with this is an option for a Fast-Clean which does the cleaning job in one hour. 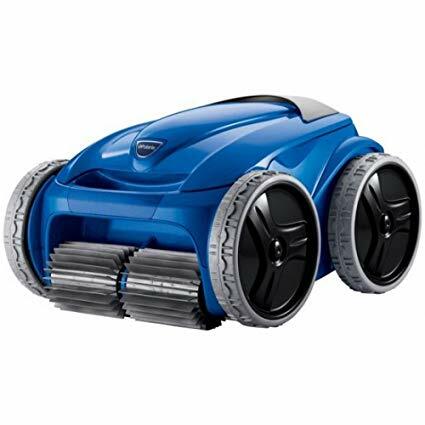 It has smart steering technology meaning it can scrub the floors of your pool in just about 2 hours on a deep clean. It also uses a lot less energy than other cleaners. It has an easy-access filter and debris cartridges which are simple to remove and clean and there is no need to turn the unit upside down. All you have to do is open the top cover and remove the filter cartridge and simply wash it with a garden hose. This unit does not require tools, hoses, pumps, hookups, or being connected to your filtration system. It is ready to use the second you remove it from the packaging. This all saves you money from the maintenance of the extras while meaning your filtration system doesn’t overwork itself with the aid of the SharkVac. This pool cleaner has some mixed reviews on Amazon, although 46% gave it five stars, while 19% gave it 4 stars, but 20% gave it only one star, with low percentages in the 2 and 3-star category. Most people complimented the units easy to clean filters and it’s impressive cleaning techniques. 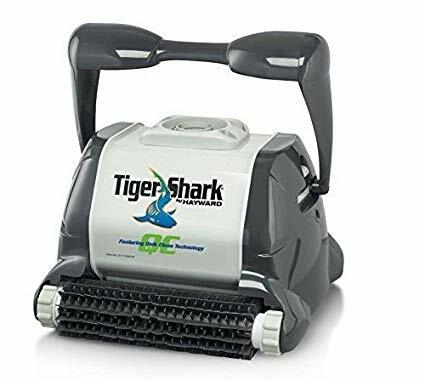 Most of these reviews claim their pool is much cleaner and pristine after they use the SharkVac. Some of the lower starred reviews complain about the SharkVac struggling to climb up the walls and the cord becoming twisted. This pool cleaner has a four-wheel drive design and has a combined style and inventive engineering for all your pool cleaning needs. It will clean your pool of debris, dirt, and dust, made possible by its advanced built-in technology features. This unit has an ActivMotion Sensor technology which means it has superb navigation no matter what size or shape your pool is and still ensures a wide coverage. It also contains a Proprietary Vortex Vacuum technology which allows the unit to pick up large debris while also maintaining suction. You can also pre-program the Polaris Sport F9550 with its 7-day programmable timer, motion sensing hand-held remote and it’s pre-programmed cleaning patterns. It has an oscillating brush which effectively removes stubborn debris, dirt, and grime from the surfaces of your pool. It can even reach under the stairs and on tight corners due to its rear water propulsion system. It has an improved power which means that it cleans quickly and efficiently. It also features a lid along with a large capacity filter canister which can easily filter debris. Once again, this product has received mixed reviews on Amazon with 50% of 303 reviews stating it was 5 stars, whereas 20% have claimed it’s a one star. 16% claimed it was 4 stars. Those claiming it is in the higher category of stars have complimented the units ability to thoroughly clean their pools, collecting leaves, sand, and other debris. The complaints mainly state that the unit does not pick up debris as well as claimed and that the cord twists. Energy Efficiency — The energy use by your robotic pool cleaner will depend on the size of the unit. Smaller units will consume about 200 watts of power every hour, whereas larger units will use much more. It’s sensible to avoid units that consume more than 1,000 watts per hour because these will cost you much more money and energy over time. Climbing Ability — A good robotic cleaner can climb walls very well and not fall off, while also cleaning. The best ones will be able to achieve this and clean the waterline and perhaps climb and clean the pool stairs. Lightweight — The size of the pool cleaner doesn’t matter too much but you don’t want a robot that you can’t even lift out of the water. If it’s too heavy, you’ll struggle to maintain the robotic cleaner and might even need extra help to move the unit which isn’t very efficient. High-quality Bushes — Scrubbing the surfaces of your pool is an important part of removing stains and dirt. Try to find a unit with high-quality brushes, preferably hard-bristle or rotating rubber brushes as these seem to be the most effective. Durability — These units can be expensive, so you want one that is going to last for a long time and maintain its quality over this time. You might have to repair it at some point, but it should last for a couple of seasons before this happens. Make sure you have a warranty. Saves You Time — If you choose to manually clean your pool, it can take a long time and a lot of effort to get the finish you desire. With a robotic pool cleaner, you don’t have worry about exerted energy or wasting time fishing debris out yourself as it will do it for you. Now you can use your time in a more useful way while your robotic friend does all the work. Saves you Energy — They are energy efficient and do not consume vast amounts of power when cleaning the pool, but they still do a great job. Saves Money — Although the initial cost might be expensive, it will save you money in the long run. You will no longer need to pay for someone to clean your pool and the energy used by the robotic cleaner is low, so cost-effective in the long run. Easy to Use and Maintain — All you have to do is drop your robotic pool cleaner into the pool and then pull it out once it has completed the job. The only work you will have to do is remove the filter bag or basket in order to clean it out. While reading this, hopefully, you have become more knowledgeable about the different types of pool cleaners and their features. You now know the top products on the market, along with their reviews and ratings from people who have already bought them. Every pool is different and needs different features from its robotic pool cleaner, therefore looking into the products before you buy them is important, and then you can choose a robotic pool cleaner that suits you and your needs. These robotic pool cleaners are worth the investment and will give you more time to do whatever you wish to do. They also allow you to enjoy a brilliant, sparkling, and pristine pool as often as you would like without you having to laboriously clean it before use. Whichever robotic pool cleaner you choose, we are certain you will be satisfied with its performance, ease-of-use, and cleaning, as well as any special features or functions you may have chosen. No matter the size of your pool, the material, or the shape, there will be a robotic pool cleaner out there to help you maintain the cleanliness and the look of your pool. Whether you have an above-ground or in-ground pool, these cleaners will save you time and energy.